Look number two with Woolovers. 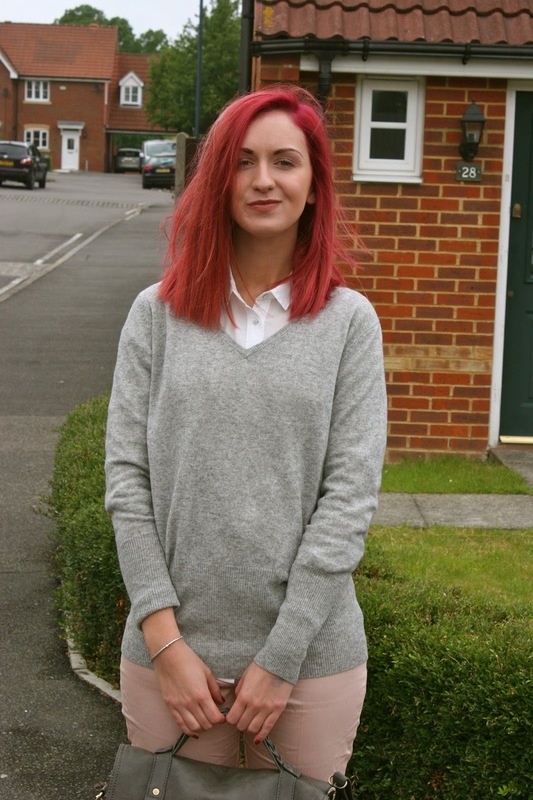 Yesterday I published my Sunday Stroll look with my Woolovers Deep V Neck Jumper. My daily work schedule changes all the time. One day I may have a lunch meeting and then in the evening I go to review a restaurant. I want to wear something smart but also stylish which can be hard to put together. Layering a v neck jumper can make an outfit look perfectly professional and it can be easily removed in the evening depending on the occasion making a stylish outfit look effortless. The WoolOvers Deep V Neck Jumper has made a very welcome appearance to my work wardrobe as it pairs with most of my outfits and can easily be mixed and matched to go from day to night. A basic grey v neck sweater may not appeal to your usual fashionista or girly girl as it can seem all too basic. But pair your favourite shoes and add a bit of colour with your skirt or trousers and it can become your new bestie! Next you’ll be wondering how your wardrobe coped without one.